The attic, a well-loved storage nook in the home, comes with its own set of environmental concerns. Unpleasant smells gathering in the attic can discourage use of the space, and once you’ve noticed the musty odor, what do you do? Simply follow these simple guidelines, and you’ll be back to storing out-of-season items and more with ease and confidence. Wear eye protection, a dust mask and gloves, particularly if you suffer from allergies. Carefully enter the attic and shine a flashlight into corners and under the eaves; you’re checking for animal droppings or other signs of occupation, mold, mildew, leaks and any other damage. Check the insulation, too. If there are items currently being stored in the attic, move them elsewhere for the duration of your cleaning; porous items such as clothing or window treatments may need to be laundered before returning to storage or use. ODOREZE™ Natural Laundry Odor Eliminator Additive can be added to your regular detergent to help remove the odors that have penetrated deeply into your fabrics and is just too strong for ordinary washing powder. This is a concentrate product that will go a long way. Non-porous items can be sprayed with ODOREZE™ Natural All Purpose Odor Eliminator and then wiped or scrubbed clean with a sponge. This product will both clean and deodorize without harsh chemicals. Remove and replace any mildewed insulation carefully; if you are uncertain that you can manage this potentially hazardous task safely, enlist the services of an expert. Be sure to seal any leaks or damage that will only allow animals and moisture to return later, and place screens on exhaust vents and chimneys. Also, windows and other openings should be caulked. Signs of current animal presence should be considered cause for caution; do not engage live animals, but defer to your local animal control office. Now that the causes of the musty attic smell have been addressed, it’s time to create more airflow. Ideally, two or more fans can be used; facing outward at the windows and/or vents to expel the odor. Placing another fan facing into the attic from its access point will also allow the fan to introduce fresh air into the space while it is expelling the bad air. After starting the air current, place SMELLEZE™ Reusable Attic Smell Removal Deodorizer Pouches around the space to eliminate any remaining odors without masking them with harmful fragrances. The fans should remain in place for a minimum of 6 hours, but preferably a few days. Take care to store only clean, dry items in the attic to prevent future occurrences. SMELLEZE™ is reusable and will last for years. All you have to do is periodically rejuvenate the pouch by simply placing in direct sunlight for a day or heating in a microwave for 4 minutes and reuse. It’s as simple as that! Lastly, dust any windowsills and large stored items. Drag out the vacuum attachments and get into all the corners and crevices, particularly if animals were present. Adding a HEPA filter will keep more dust and allergens out of the air as well. Remnants of wet matter should only be cleaned up with a vacuum rated for wet/dry surfaces to avoid the risk of shock. Do final inspections to make sure everything looks like it has been taken care of, and then move the remaining items back in. 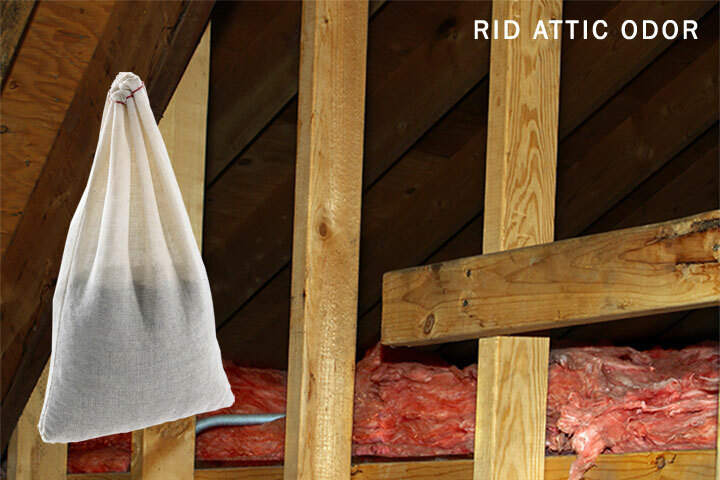 Hopefully this article helped you understand how to tackle that musty attic odor. If you follow the guide here you should be able to get your attic back in shape in no time. If there is something I left off this post, make sure to leave it in the comments! Mold remefiation done on attic and bathrooms due to broken tyb traps and sewer line. Musky odor remains. Please help! I would highly suggest using our Smelleze™ Reusable Musty Smell Deodorizer Pouch in the attic to absorb the musty smell as well as help prevent mold growth. We recently bought an older house and want to know what to get to remove musty smell. It has now gotten in my clothes so when we go out people comment on the odor. Please help. I would recommend putting our Smelleze™ Reusable Musty Smell Deodorizer Pouch around your home. Our XL pouch covers 150 sq. ft. The upstairs attic has been converted to bedrooms for years and smell musty, stale and dusty. I assume coming from the crawl spaces. Who can I call to analyze the problem? We do not have qualifications to offer advice on who to call but if you want to minimize the odor i would recommend using our SMELLEZE™ Reusable Attic Smell Removal Deodorizer Pouch in the areas where you smell the odor.